The kiddos and I enjoy a little holiday time with Sprout at Universal Studios! 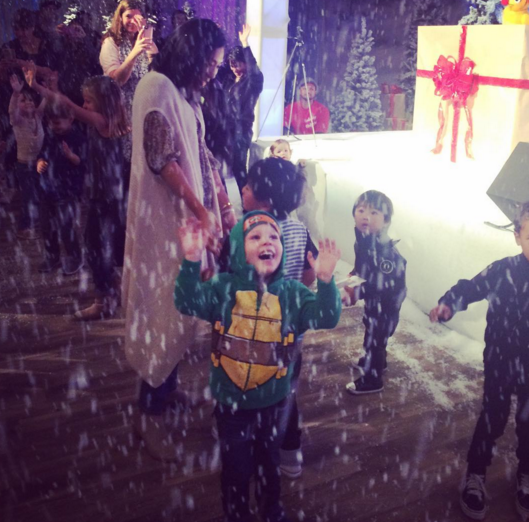 The snow was falling and the hot chocolate was flowing at Sprout's "Holidays Unwrapped" celebration at Universal Studios. 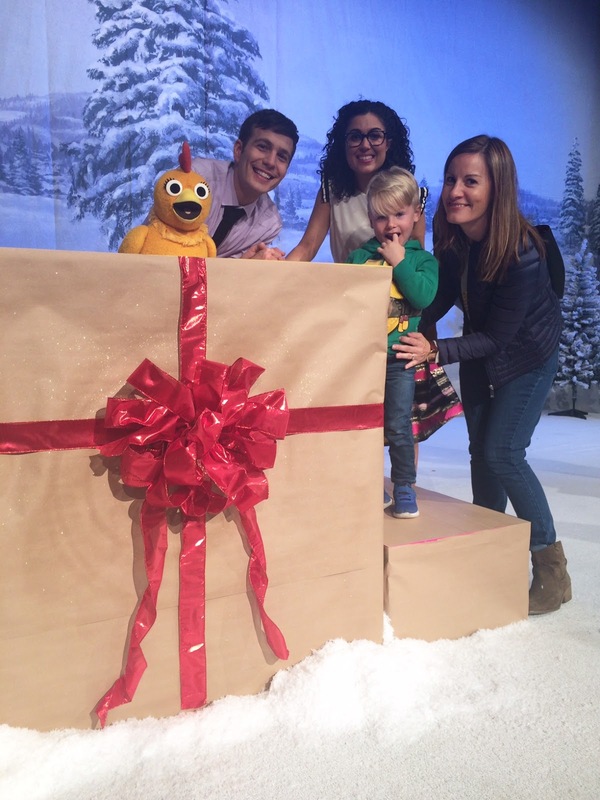 Just before Thanksgiving, the preschool-focused channel hosted an awesome shindig, complete with an indoor ice rink, live performances from Sprout friends Carly Ciarrocchi, Tim Kubart, and a special appearance from Chica! 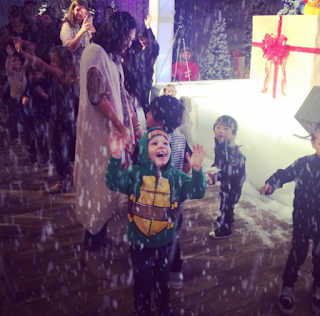 Will goes crazy over the magical indoor snow. 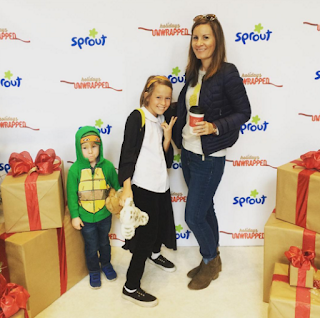 The singing, dancing and crafting fun helped usher in a huge shout-out to Sprout's holiday programming, which features several new seasonal episodes of popular shows. 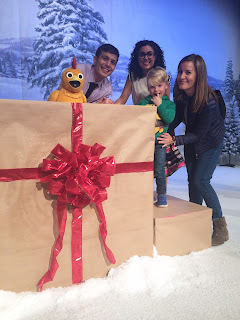 Will and I got to meet Chica and friends! Check out what Sprout has planned for this holiday season! "Terrific Trucks Save Christmas" — In this Sprout original holiday special, the Terrific Trucks are handed their biggest job yet. This live-action series finds the five trucks banding together to fight back against a bullish businessman who wants to ruin Christmas by preventing the local town’s hundred-year-old Christmas tree raising tradition. "Nina's World: Hanukkah Adventure" — Nina and friends learn about Hanukkah and celebrate their first snow storm in the city. Actress Mayim Bialik plays Jennifer Goldstein, who leads Nina, Carlos and Chelsea in a city-wide search for oil to help make Hanukkah treats and to light the community menorah with while teaching the kids about the true story of Hanukkah. "Ruff-Ruff, Tweet and Dave, a Christmas Adventure" — Ruff-Ruff, Tweet and Dave find Santa’s hat and set off to return it to him, to save Christmas Day. For without his hat, Santa can’t drive his sleigh and won’t be able to deliver anyone any presents. Along the way, they help their friends have a perfect Christmas, by singing them a special Christmas song and decorating their tree. "Noddy Toyland Detective: The Case of the Snow Mystery" — How can Noddy make it snow in Toyland on Christmas Day? Noddy needs to investigate right away. "Noddy Toyland Detective: The Case of the Snow Mystery" was co-produced by DreamWorks Animation and Gaumont Animation. "Dot. : The Holiday Tree" — Dot is horrified to discover she’s accidentally gotten rid of all the decorations for the town tree. She works round the clock to make new ones and discovers the joy that comes with giving and sharing. “A Song for Everyone”: Dot and her friends work together to write a song for the Winter Concert that will speak to the entire town, regardless of what holiday they celebrate, but their performance is threatened by a snow storm. "Dot." is a new original series based on the book by bestselling author Randi Zuckerberg, and is produced by Industrial Brothers in association with The Jim Henson Company and the Canadian Broadcasting Corporation.